So, How’s That Whole Party-Switching Thing Working Out for You, Mr. Specter? 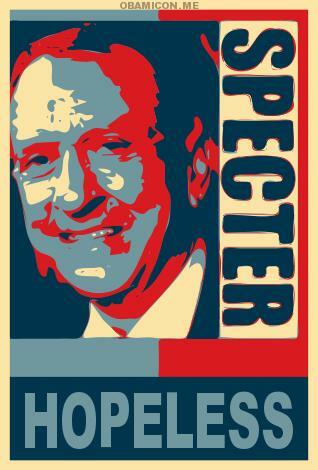 Arlen Specter’s belief that he would be welcomed warmly by Democrats was never realistic. Liberals had cheered him every time when, as a Republican, he plunged his knife into the backs of his colleagues, but why would Democrats invite a known backstabber into their own ranks? [O]ne year after he switched his affiliation from Republican to Democrat in part to claim a sixth term, he is still viewed with suspicion by many in the party and faces the gravest threat of his 30-year Senate career because a significant portion of Democratic voters simply cannot get accustomed to the idea that Specter is one of them. Rep. Joe Sestak, a second-term congressman and retired admiral, is surging in the polls and seems to have momentum headed into Tuesday’s primary . . .
Republican Pat Toomey would stomp Specter into geriatric smithereens in November, and the attendant demoralization of Democratic voters would help GOP candidates down the ticket. If Specter should lose the primary, however, Joe Sestak might be able to rally Democrats. Sestak would certainly get more support from independents, who can at least respect an honest Democrat, whereas a political hermaphrodite like Specter . . . not so much. Arlen Specter launched a TV ad Tuesday featuring the Democrats’ biggest star, President Barack Obama. But Obama won’t be bringing his star power to Pennsylvania to stump for Specter ahead of next week’s primary election, according to the White House. . . . The new ad follows a statewide anti-Specter ad put out by Joe Sestak, Specter’s challenger in the Democratic U.S. Senate primary. Sestak’s ad shows then-Republican Specter receiving similar accolades from President George W. Bush in 2004. . .
Specter’s Obama ad will play especially well in Philadelphia, where both men remain popular. Philadelphia is Specter’s traditional base, and his political future may hinge on voter turnout in the city. But Obama’s failing to appear there in person may hurt Specter’s effort to energize the base. Meanwhile, Vice President Joe Biden confirmed on NBC’s ‘ ‘Today” show Tuesday that he will be campaigning for Specter before next week’s primary. So the White House is sending in the B-team, suggesting that they’ve spotted him for a hopeless loser and don’t want to diminish the President’s prestige any further by associating Obama too directly with that useless old crapweasel, Arlen Specter. Exit question: If Democrats can see through Arlen Specter, why are some Republicans still supporting useless crapweasel John McCain? If It’s A Wonderful Life was made about Arlen Spector, he would realize that everyone would be better off had he never been born. One thing that I don’t get is Sestak has said on several different occassions that he was offered a job to drop out of the race. Why would someone vote for a man that obstructing justice to a crime? Don’t get me wrong, I want Specter gone, but this isn’t even a choice between lesser evils. Good for Toomey I suppose. I disagree with Mac on many issues, but as bad as he can be, he is no Arlen Spector. Not even close. Arlen demonstrates a certain level of creepiness and decay of soul not often seen in politics and public life. Frankly the Republican that really needs to go is Lindsay Graham, and even he is hardly in the same league as Arlen. You mean the way the way Obama saved Coakley in Massachusetts or Corzine in New Jersey? Maybe Spector concluded he had enough problems already. The Dems deserve Benedict Arlen to be their candidate. I want the pleasure of seeing Toomey hand him his walking papers. …don’t want to diminish the President’s prestige any further by associating Obama too directly with that useless old crapweasel, Arlen Specter. Exit answer: Are you just a complete idiot? You must be to compare Specter to McCain. Specter: lifetime ACU rating – 44. McCain – 82. Yeah, practically twins. PLUS, McCain is running against known crook and loud-mouthed idiot J.D. Hayworth, one of the few Abramoff bribe, I mean contribution, recipients NOT to return the ill-gotten funds, and who has NEVER reimbursed Abramoff for the cost of using his stadium sky-box for fund-raising events AS REQUIRED BY LAW. The Birther-promoting jerk who only avoided a formal Ethics investigation by losing his “safe” House seat. If you can listen to J.D. Hayworth for five minutes and not conclude he is a moron, it means you are one, too. He is only way we could possibly endanger this seat in the election. No matter how lacking in intelligence you may be, do try to strain your brain on this one. Just because Babs likes the jackass and sprung for a few meals for RSMcC . . . oh, never mind. Virginia Right! News Hound for 5/13/2010 | Virginia Right!